Your cat may need to travel in the car if you are going to the vet, or he may need to travel for longer periods if you are going on holiday or attending a cat show. A cat must never travel unrestrained in a car – it is very dangerous for cat and driver alike. Some cats do suffer from car-sickness. This can be caused by a faint smell of petrol or diesel but, more often than not, it is caused by the motion of the car which can affect their sense of balance coupled with a fear of unfamiliar territory. 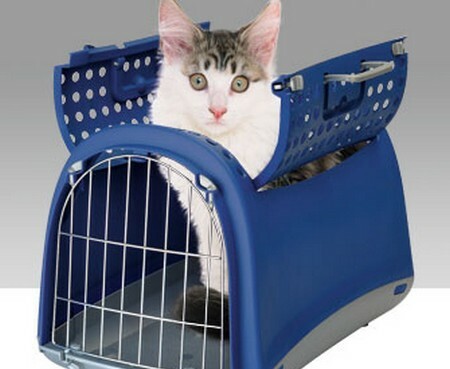 As a minimum requirement you will need a secure carrier, but if you have a kitten pen or travelling pen, you can acclimatise your cat to travel in his pen complete with his litter tray. The beauty of this set-up is that it enables your cat to have the freedom to move about within an enclosed space. Equipment: Cat carrier, kitten or travelling pen, optional litter tray and water bowls. Training objective: To enable your cat to travel in his carrier in the car as part of his normal routine, without injury to himself or creating danger for the driver. Make sure your cat is familiar with and comfortable in his carrier or pen. Do not feed your cat before a journey to avoid car-sickness. Take your cat for a short ride in the car. If he shows any sign of being restless after a short journey take him home again. After a couple of days’ break, take him for another car ride, of longer duration. Repeat these journeys on a regular basis, making sure that each drive is longer than the last one. You will be able to assess when your cat feels comfortable with the routine and shows no agitation when getting into the car. Reward him by giving affection and treats.